A true color image of Ganymede is acquired by the Galileo spacecraft on June 26, 1996. Credit: PlanetUser, NASA, JPL. Planetary sciences study the effects on non-stellar objects of the apparent orbits around stars usually within a light year. Planetary science (rarely planetology) is the scientific study of planets (including Earth), moons, and planetary systems, in particular those of the Solar System and the processes that form them. It studies objects ranging in size from micrometeoroids to gas giants, aiming to determine their composition, dynamics, formation, interrelations and history. It is a strongly interdisciplinary field, originally growing from astronomy and earth science, but which now incorporates many disciplines, including planetary astronomy, planetary geology (together with geochemistry and geophysics), atmospheric sciences, oceanography, hydrology, theoretical planetary science, glaciology, and the study of extrasolar planets. Allied disciplines include space physics, when concerned with the effects of the Sun on the bodies of the Solar System, and astrobiology. "Energetic photons, ions and electrons from the solar wind, together with galactic and extragalactic cosmic rays, constantly bombard surfaces of planets, planetary satellites, dust particles, comets and asteroids." "[I]nterplanetary space ... is a stormy and sometimes very violent environment permeated by energetic particles and radation constantly emanating from the Sun." SIMS indicates secondary ion mass spectrometry. Def. an action or process of throwing or sending out a traveling ray in a line, beam, or stream of small cross section is called radiation. Def. "[t]he process of bombardment-induced surface alteration or damage" is called space weathering. In antiquity the classical planets were the non-fixed objects visible in the sky, known to various ancient cultures. The classical planets were therefore the Sun and Moon and the five non-earth planets of our solar system closest to the sun (and closest to the Earth); all easily visible without a telescope. They are Mercury, Venus, Mars, Jupiter, and Saturn. Apparently 5102 b2k (before the year [Epoch astronomy] 2000.0), -3102 or 3102 BC, is the historical year assigned to a Hindu table of planets that does not include the classical planet Venus. "Vénus seule ne s'y trouvait pas." "Venus alone is not found there." (c) has cleared the neighbourhood around its orbit" is called a planet. Def. a wanderer that is a moving light in the sky is called a planet. This is the original description meant by the word "planet". Def. a celestial body "formed by accumulation of a rocky core, on a much longer timescale, ≳ 107 yr, with subsequent acquisition of a gaseous envelope if the circumstances allow this, and with an initially fractionated elemental composition" is called a planet. A meteor is the visible path of a meteoroid that has entered the Earth's atmosphere. Meteors typically occur in the mesosphere, and most range in altitude from 75 km to 100 km. Millions of meteors occur in the Earth's atmosphere every day. Most meteoroids that cause meteors are about the size of a pebble. The Earth has a blue halo when seen from space. Credit: NASA Earth Observatory. The Earth can have a blue sky and a blue ocean. Credit: Frokor. Def. a layer of gases that may surround a material body of sufficient mass, and that is held in place by the gravity of the body is called an atmosphere. Def. the gases surrounding the Earth or any astronomical body is called an atmosphere. If the wind is blowing and the temperature is above freezing, you may be buffeted by an invisible force. The atmosphere of Earth, assuming that's the planet's solid surface you're bipedally standing on, is composed of small particles called molecules. While the wind may be physically assaulting you, it's actually these molecules, lots of them, that are contacting your skin. The main reason you're holding your shape is that your internal fluids and solids are pushing back. These molecules in many instances are in turn made up of atoms of chemical elements. At your geographical location, specified in latitude and longitude, this gaseous envelope extends upward. The atmosphere of Earth changes with altitude. At high enough altitude the composition changes significantly, as does the temperature and pressure. If you've packed the appropriate instruments on board for the trip upward, you may have noticed something else has changed. The Earth's atmosphere is a relatively bright source of gamma rays produced in interactions of ordinary cosmic ray protons with air atoms. Troposphere — surface to 8,000 m at the poles – 18,000 m at the equator, ending at the Tropopause. Exosphere — Thermosphere to 10,000 km, after altitude regions. Atmospheric gases scatter blue light more than other wavelengths, giving the Earth a blue halo when seen from space, as shown in the image at right. The Williamette Meteorite is on display at the American Museum of Natural History in New York City. Credit: Dante Alighieri. This image is a cross-section of the Laguna Manantiales meteorite showing Widmanstätten patterns. Credit: Aram Dulyan. Def. a metallic or stony object that is the remains of a meteor is called a meteorite. Many of the meteorites that are found on Earth turn out to be from other solar system objects: the Moon and Mars, for example. Widmanstätten patterns, also called Thomson structures, are unique figures of long nickel-iron crystals, found in the octahedrite iron meteorites and some pallasites. They consist of a fine interleaving of kamacite and taenite bands or ribbons called lamellæ. Commonly, in gaps between the lamellæ, a fine-grained mixture of kamacite and taenite called plessite can be found. This is a micrometerorite collected from the antarctic snow. Credit: NASA. Micrometeorite is often abbreviated as MM. Most MMs are broadly chondritic in composition, meaning "that major elemental abundance ratios are within about 50% of those observed in carbonaceous chondrites." Some MMs are chondrites, (basaltic) howardite, eucrite, and diogenite (HED) meteorites or Martian basalts, but not lunar samples. "[T]he comparative mechanical weakness of carbonaceous precursor materials tends to encourage spherule formation." From the number of different asteroidal precursors, the approximate fraction in MMs is 70 % carbonaceous. "[T]he carbonaceous material [is] known from observation to dominate the terrestrial MM flux." The "H, L, and E chondritic compositions" are "dominant among meteorites but rare among micrometeorites." Using an imaging radar technique, the Magellan spacecraft was able to lift the veil from the face of Venus and produce this spectacular high resolution image of the planet's surface. Red, in this false-color map, represents mountains, while blue represents valleys. Credit: Magellan Team, JPL, NASA. "The spectrum of gaseous methane at 77 K in the 1.1-2.6 µm region [is] a benchmark for planetary astronomy". "The advantages of radar in planetary astronomy result from (1) the observer's control of all the attributes of the coherent signal used to illuminate the target, especially the wave form's time/frequency modulation and polarization; (2) the ability of radar to resolve objects spatially via measurements of the distribution of echo power in time delay and Doppler frequency; (3) the pronounced degree to which delay-Doppler measurements constrain orbits and spin vectors; and (4) centimeter-to-meter wavelengths, which easily penetrate optically opaque planetary clouds and cometary comae, permit investigation of near-surface macrostructure and bulk density, and are sensitive to high concentrations of metal or, in certain situations, ice." This is a visual image of the Sun with some sunspots visible. The two small spots in the middle have about the same diameter as our planet Earth. Credit: NASA. The Sun passes overhead every day on Earth. The size of its disc is very close to that of the Moon. Regarding the fixed stars, the Sun appears from Earth to revolve once a year along the ecliptic through the zodiac, and so Greek astronomers considered it to be one of the seven planets (Greek planetes, "wanderer"), after which the seven days of the week are named in some languages. "And Helios, lord of the sun, sitting Away from the other gods, sitting in his own temple And listening to prayers breathing up from men: he heard." "[A]stronomically, the visible Helios occupies the central position among the seven planets - Kronos, Zeus, Ares, Helios, Aphrodite, Hermes, and Selene, in a descending series." 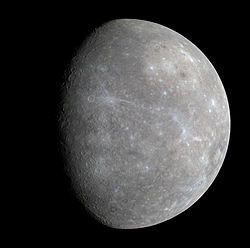 This is a full-color image of Mercury from the first MESSENGER flyby. Credit: NASA/ Johns Hopkins University Applied Physics Laboratory/Carnegie Institution of Washington. "Optical reflectance studies of Mercury provide evidence for Mg silicates." "Solar heating at ‘‘noontime’’ at Mercury’s equator causes surface temperatures of ~700 K, while the side of Mercury away from the Sun cools to ~100 K (due to radiation losses) during the long night." "Mercury [has a] tenuous ballistic [atmosphere]." The MESSENGER X-ray spectrometer (XRS) maps mineral composition within the top millimeter of the surface on Mercury by detecting X-ray spectral lines from magnesium, aluminum, sulphur, calcium, titanium, and iron, in the 1-10 keV range. This is an image of Venus in true color. The surface is obscured by a thick blanket of clouds. Credit: NASA/Ricardo Nunes, http://www.astrosurf.com/nunes. An ultraviolet image of the planet Venus is taken on February 26, 1979, by the Pioneer Venus Orbiter. Credit: NASA. This is a false color image of Venus produced from a global radar view of the surface by the Magellan probe while radar imaging between 1990-1994. Credit: NASA. Some objects seem to wander around in the night sky relative to many of the visual points of light. At least one occasionally is present in the early morning before sunrise as the Morning Star and after sunset as the Evening Star, the planet Venus. Apparently 5102 b2k (before the year 2000.0), -3102 or 3102 BC, is the historical year assigned to a Hindu table of planets that does not include the classical planet Venus. "Vénus seule ne s'y trouvait pas." "Venus alone is not found there." Violet photographs of the planet Venus taken in 1927 “recorded two nebulous bright streaks, or bands, running ... approximately at right angles to the terminator” that may be from the upper atmosphere. When imaged in visible light (upper right image) Venus appears like a gas dwarf rather than a rocky planet. The same image result occurs when it is viewed in the ultraviolet (second image at right). However, when viewed using radio astronomy, the resulting radar image, at left, shows that just beneath the cloud layers is a rocky planet. The Earth and Moon is imaged by the Mars Global Surveyor on May 8, 2003, at 12:59:58 UTC. This view of the rising Earth greeted the Apollo 8 astronauts as they came from behind the Moon after the lunar orbit insertion burn. Credit: NASA. This true-color image shows North and South America as they would appear from space 35,000 km (22,000 miles) above the Earth. Credit: Reto Stöckli, Nazmi El Saleous, and Marit Jentoft-Nilsen, NASA GSFC. This image is a composite of the first picture of the Earth in X-rays over a diagram of the Earth below. Credit: NASA, Ruth Netting. For those observers looking toward the Earth from another location such as near the Moon in the photograph at above right, it seems that the Earth is a natural object. On the Earth 384,000 km away, the sunset terminator bisects Africa. A closer view of Earth shows some of the astronomical objects near the Earth and apparently just above the surface, where an observer may be. Some of these objects such as clouds probably by convention are more likely to be studied by planetary observers, or weather observers, rather than astronomical observers. With perspectives other than upwards from the Earth's crustal surface, the word "sky" may seem insufficient or inappropriate, although studying the Earth as part of planetary science may leave interesting astronomical objects near the Earth that are occasionally "in the sky". The idea being that the Earth cannot be in its own sky, or can it? Perhaps, it is more a matter of whether other observers agree that what an observer is observing is astronomy or planetary science, or both. The Earth is a known astronomical object. It is usually not thought of as an X-ray source. At left is a composite image which contains the first picture of the Earth in X-rays, taken in March, 1996, with the orbiting Polar satellite. The area of brightest X-ray emission is red. Energetic charged particles from the Sun energize electrons in the Earth's magnetosphere. These electrons move along the Earth's magnetic field and eventually strike the ionosphere, causing the X-ray emission. "The search for life on extrasolar planets" requires a test of vegetation detectability from a single dot source. "The earthshine, or ashen light, is the glow of the dark part of the lunar disk visible to a night-time observer. ... [T]he light rays coming from different parts of the Earth are mixed together in the ashen light and mimic the Earth as a single dot." "[T]he vegetation spectrum which is unequivocal ... presents a bump at 0.5 µ in the green wavelength range, which implies that plants appear green". Although the image contains a layer of cumulus clouds, at the horizon, the Atlantic Ocean meets the edge of the sky. Location :Salvador, Bahia, Brazil, July 4, 2008. Credit: Tiago Fioreze. This is a 360° view of the surrounding terrain, horizon and Martian sky, taken on November 23-28, 2005, by the Exploration Rover 'Spirit'. Credit: NASA. A view of the horizon on the Moon's solid surface shows a black sky without stars because of sunlight coming from the left. Credit: NASA. Being outside in the day light to look upward when the Sun is off to the East or West, you may see that the sky is blue depending on the weather. There are many other natural objects, entities, bodies, or phenomena that occur in the sky. Some of these may occur frequently: the Sun passes overhead every day, so does the Moon either during the day or at night, a variety of clouds pass across the sky and sometimes completely fill the sky for days, occasionally a few go in the opposite direction across the sky or in different directions. Def. "the expanse of space that seems to be over the earth like a dome" is called the sky, or the sometimes the heavens. This definition applies especially well to an individual on top of the Earth's solid crust looking around at what lies above and off to the horizon in all directions. Similarly, it applies to an individual's visual view while floating on a large body of water, where off on the horizon is still water. 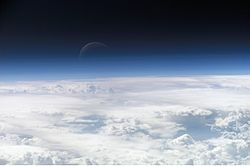 The image at right shows the horizon marking the lower edge of the sky and the upper edge of the Atlantic Ocean, with a layer of cumulus clouds just above. A more general definition of 'sky' allows for skies as seen on other worlds. At left is a 360° panorama of the horizon on Mars as perceived in the visual true-color range of the NASA Mars Exploration Rover 'Spirit' on November 23-8, 2005. Def. an "expanse of space that seems to be [overhead] like a dome" is called a sky. Even in day light, the sky may seem absent of objects if a nearby source tends to overwhelm other luminous objects. At right is a view of the horizon on the Moon's solid surface taken by an Apollo 16 astronaut. The image shows a black sky without stars because the sunlight coming from the left is overwhelming. Mount Redoubt in Alaska erupted on April 21, 1990. The mushroom-shaped plume rose from avalanches of hot debris that cascaded down the north flank. Credit: R. Clucas, USGS. This oblique astronaut photograph from the International Space Station (ISS) captures a white-to-grey volcanic ash and steam plume extending westwards from the Soufriere Hills volcano. Credit: NASA Expedition 21 crew. Oblique images such as the one at right are taken by astronauts looking out from the ISS at an angle, rather than looking straight downward toward the Earth (a perspective called a nadir view), as is common with most remotely sensed data from satellites. An oblique view gives the scene a more three-dimension quality, and provides a look at the vertical structure of the volcanic plume. While much of the island is covered in green vegetation, grey deposits that include pyroclastic flows and volcanic mud-flows (lahars) are visible extending from the volcano toward the coastline. When compared to its extent in earlier views, the volcanic debris has filled in more of the eastern coastline. Urban areas are visible in the northern and western portions of the island; they are recognizable by linear street patterns and the presence of bright building rooftops. The silver-grey appearance of the Caribbean Sea surface is due to sun-glint, which is the mirror-like reflection of sunlight off the water surface back towards the hand-held camera on-board the ISS. The sun-glint highlights surface wave patterns around the island. This is an aerial view of the Barringer Meteor Crater about 69 km east of Flagstaff, Arizona. Credit:D. Roddy, U.S. Geological Survey. The Chicxulub impact crater is outlined. Credit: NASA/JPL-Caltech, modified by David Fuchs. Occasionally, objects fall from the sky. When and where this occurs, depending on the energy dumped into the atmosphere and the impact on the crust of the Earth, life forms nearby hear it, feel the vibrations from it, and recoil if the intensity is too high. But asteroid impacts, though rare, occur once in a while, over very large areas, at aperiodic intervals such as the Chicxulub crater. Most scientists agree that this impact is the cause of the Cretatious-Tertiary Extinction, 65 million years ago (Ma), that marked the sudden extinction of the dinosaurs and the majority of life then on Earth. This shaded relief image of Mexico's Yucatan Peninsula shows a subtle, but unmistakable, indication of the Chicxulub impact crater. Here at low tide in Sandwich Bay birds are gathering. Credit: Nick Smith. This pair of images shows the dramatic difference between a high tide and a low tide. Credit: NASA/GSFC/METI/ERSDAC/JAROS, and U.S./Japan ASTER Science Team. In addition to the Sun, the Moon affects life forms on Earth such as those along the shores of bodies of water through the production of tides. "Due to phenomena such as ice ages, plate tectonics, land uplift, erosion and sedimentation, tides have changed dramatically over thousands of years". "Some tides on the East Coast of the United States ... may ... have [had] ... a difference between low and high tide of 10-20 feet, instead of the current 3-6 foot range." But they "didn’t amount to much at all about 5,000 years ago. ... [A]round that same time, tides on the southern U.S. Atlantic coast, from North Carolina to Florida, were about 75 percent higher." "[A]round 9,000 years ago ... there was a huge amplification in tides of the western Atlantic Ocean. The tidal ranges were up to three times more extreme than those that exist today, and water would have surged up and down on the East Coast." Today Hudson Bay is a place "where tidal energy gets dissipated at a disproportionately high rate ... But during the last ice age Hudson Bay was closed down and buried in ice, and that caused more extreme tides elsewhere." "This pair of images [on the left] from the Advanced Spaceborne Thermal Emission and Reflection Radiometer (ASTER) on NASA’s Terra satellite shows the dramatic difference in the amount of water-covered land at the head of the southeast corner of the bay during a high tide on April 20, 2001, and a low tide on September 30, 2002. Vegetation is green, and water ranges from dark blue (deeper water) to light purple (shallow water)." The Aurora Borealis, or Northern Lights, shines above Bear Lake, Alaska. Credit: Senior Airman Joshua Strang, United States Air Force. Laboratory experiment produces aurora at the poles of a sphere. Credit: David Monniaux. Computer simulations are usually used to represent auroras. The image at right shows a terrella in a laboratory experiment to produce auroras. "Although auroras might first appear to be moonlit clouds, they only add light to the sky and do not block background stars from view. Called "Northern Lights" in the Northern Hemisphere, auroras are caused by collisions between charged particles from the magnetosphere and air molecules high in the Earth's atmosphere. If viewed from space, auroras can be seen to glow in X-ray and ultraviolet light as well. Predictable auroras might occur a few days after a powerful magnetic event has been seen on the sun." Most aurorae occur in a band known as the auroral zone, which is typically 3° to 6° in latitudinal extent and at all local times or longitudes. The auroral zone is typically 10° to 20° from the magnetic pole defined by the axis of the Earth's magnetic dipole. During a geomagnetic storm, the auroral zone will expand to lower latitudes. The diffuse aurora is a featureless glow in the sky which may not be visible to the naked eye even on a dark night and defines the extent of the auroral zone. The discrete aurora are sharply defined features within the diffuse aurora which vary in brightness from just barely visible to the naked eye to bright enough to read a newspaper at night. Discrete aurorae are usually observed only in the night sky because they are as bright as the sunlit sky. Aurorae occasionally occur poleward of the auroral zone as diffuse patches or arcs (polar cap arcs), which are generally invisible to the naked eye. This image shows a late-summer rainstorm in Denmark. The nearly black color of the cloud's base indicates the foreground cloud is probably cumulonimbus. Credit: Malene Thyssen. This is a panorama photograph taken during a lightning storm over Bucharest, Romania. Credit: Catalin.Fatu. There are some 500 terrestrial gamma-ray flashes daily. The red dots show those the Fermi Gamma-ray Space Telescope spotted through 2010. Credit: NASA/Goddard Space Flight Center. On Earth, between the surface and various altitudes there is an electric field. It changes with altitude from about 150 volts per meter to lower values at higher altitude. In fair weather, it is relatively constant, in turbulent weather it is accompanied by ions. At greater altitude these chemical species continue to increase in concentration. Usually when clouds fill the sky and associated with some of these clouds is lightning, a phenomenon that moves so quickly it’s difficult to think of it as an object or entity with a body. A number of observations by space-based telescopes have revealed ... gamma ray emissions ... terrestrial gamma-ray flashes (TGFs). These observations pose a challenge to current theories of lightning, especially with the discovery of the clear signatures of antimatter produced in lightning. A TGF [has been linked] to an individual lightning stroke occurring within 1.5 ms of the TGF event, proving for the first time that the TGF was of atmospheric origin and associated with lightning strikes. The Reuven Ramaty High Energy Solar Spectroscopic Imager (RHESSI) spacecraft, as reported by David Smith of UC Santa Cruz, has been observing TGFs at a much higher rate, indicating that these occur about 50 times per day globally (still a very small fraction of the total lightning on the planet). The energy levels recorded exceed 20 MeV. ... [Apparently, the] gamma radiation fountains upward from starting points at surprisingly low altitudes in thunderclouds. Steven Cummer, from Duke University's Pratt School of Engineering, said, "These are higher energy gamma rays than come from the sun. And yet here they are coming from the kind of terrestrial thunderstorm that we see here all the time." In 2009, the Fermi Gamma Ray Telescope in Earth orbit observed [an] intense burst of gamma rays corresponding to positron annihilations coming out of a storm formation. Scientists wouldn't have been surprised to see a few positrons accompanying any intense gamma ray burst, but the lightning flash detected by Fermi appeared to have produced about 100 trillion positrons. This has been reported by media in January 2011, it is an effect, never considered to happen before. Into the exosphere or outer space, temperature rises from around 1,500°C to upwards of 100,000 K.
In this diagram, the prominent features in the ionosphere-thermosphere system and their coupling to the different energy inputs show the complex temporal and spatial phenomena that are generated. Credit: NASA. Upon reaching the top of the mesosphere, the temperature starts to rise, but air pressure continues to fall. This is the beginning of the ionosphere, a region dominated by chemical ions. Many of them are the same chemicals such as nitrogen and oxygen in the atmosphere below, but an ever increasing number are hydrogen ions (protons) and helium ions. These can be detected by an ion spectrometer. The process of ionization removes one or more electrons from a neutral atom to yield a variety of ions depending on the chemical element species and incidence of sufficient energy to remove the electrons. The Zodiacal Light is over the Faulkes Telescope, Haleakala, Maui. Credit: 808caver. "According to Gruson and Brugsch the Egyptians were acquainted with, and even worshipped, the zodiacal light from the very earliest times, as a phenomenon visible throughout the East before sunrise and after sunset. It was described as a glowing sheaf or luminous pyramid perpendicular to the horizon in summer, and inclined more or less during the winter. Indeed the Egyptians represented the zodiacal light under the form of a triangle which sometimes stood upright and at other times was inclined." These images show the libration of the Moon over a single lunar month. Credit: Tomruen. The image shows the hydrogen concentrations on the Moon detected by the Lunar Prospector. Credit: NASA. The Chandra X-ray Observatory image at right of the bright portion of the Moon is from oxygen, magnesium, aluminum and silicon atoms. Credit: Optical: Robert Gendler; X-ray: NASA/CXC/SAO/J.Drake et al. The Moon is seen by the Compton Gamma Ray Observatory, in gamma rays of greater than 20 MeV. Credit: D. J. Thompson, D. L. Bertsch (NASA/GSFC), D. J. Morris (UNH), R. Mukherjee (NASA/GSFC/USRA). This image is an elemental map of the Moon using a GRS. Credit: Los Alamos National Laboratory. The Moon effects life forms on Earth such as those along the shores of bodies of water through the production of tides. "[F]luxes of ions should be measurable from a detector in a 100 km lunar orbit." PSD of sodium by ultraviolet photons contributes substantially to the Moon's atmosphere. At right is the result of an all Moon survey by the Lunar Prospector using an onboard neutron spectrometer (NS). Cosmic rays impacting the lunar surface generate neutrons which in turn loose much of their energy in collisions with hydrogen atoms trapped within the Moon's surface. Some of these thermal neutrons collide with the helium atoms within the NS to yield an energy signature which is detected and counted. The NS aboard the Lunar Prospector has a surface resolution of 150 km. "Lunar X-rays are thought to be produced by the scattering or fluorescence of solar X-rays from the Moon's surface (Schmitt et al., 1991)." X-rays from the dark moon, or shadowed portion of the Moon, can be explained by radiation from Earth's geocorona (extended outer atmosphere) through which orbiting spacecraft such as the Chandra X-ray Observatory move. The Chandra X-ray Observatory has detected X-rays from oxygen, magnesium, aluminum and silicon atoms on the Moon. The Compton Gamma Ray Observatory has imaged the Moon in gamma rays of energy greater than 20 MeV. These are produced by cosmic ray bombardment of its surface. Gamma-ray spectrometers have been widely used for the elemental and isotopic analysis of airless bodies in the Solar System, especially the Moon These surfaces are subjected to a continual bombardment of high-energy cosmic rays, which excite nuclei in them to emit characteristic gamma-rays which can be detected from orbit. Thus an orbiting instrument can in principle map the surface distribution of the elements for an entire planet. They are able to measure the abundance and distribution of about 20 primary elements of the periodic table, including silicon, oxygen, iron, magnesium, potassium, aluminum, calcium, sulfur, and carbon. The chemical element thorium [is] mapped [by a GRS], with higher concentrations shown in yellow/orange/red in the left-hand side image shown on the right. Def. that part of outer space between the planets of a solar system and its star is called interplanetary space. Def. the material which fills the solar system and through which all the larger solar system bodies such as planets, asteroids and comets move is called an interplanetary medium. "It is found that near 1 AU, the dominant group of the local geometrical cross section changes." Approximately 80 % of interplanetary dust is cometary at R ~ 0.8 AU. A photo of the planet Mars is taken in Straßwalchen (Austria) on September 19, 2003, shortly after its closest approach. Credit: Rochus Hess, http://members.aon.at/astrofotografie. The tenuous atmosphere of Mars is visible on the horizon in this low-orbit photo. Credit: . Mars is imaged from Hubble Space Telescope on October 28, 2005, with dust storm visible. Credit: . Mars made its closest approach to Earth and maximum apparent brightness in nearly 60,000 years, 55,758,006 km (0.372719 AU), magnitude −2.88, on 27 August 2003 at 9:51:13 UT. Mars is the fourth planet from the Sun in the Solar System. Named after the Roman god of war, Mars, it is often described as the "Red Planet" as the [iron(III) oxide] iron oxide prevalent on its surface gives it a reddish appearance. The red-orange appearance of the Martian surface is caused by iron(III) oxide, more commonly known as hematite, or rust. ... Much of the surface is deeply covered by finely grained iron(III) oxide dust. This color picture is made from images taken by the imaging system on the Galileo spacecraft about 14 minutes before its closest approach to asteroid 243 Ida on August 28, 1993. Credit: NASA/JPL. Derivative work: Chzz. The asteroid belt is shown in (white) and the Trojan asteroids (green). Credit: . The majority of known asteroids orbit within the asteroid belt between the orbits of Mars and Jupiter This belt is now estimated to contain between 1.1 and 1.9 million asteroids larger than 1 km in diameter, and millions of smaller ones. "The recent investigation of the orbital distribution of Centaurs (Emel’yanenko et al., 2005) showed that there are two dynamically distinct classes of Centaurs, a dominant group with semimajor axes a > 60 AU and a minority group with a < 60 AU." T]he intrinsic number of such objects is roughly an order of magnitude greater than that for a<60 AU. "From the dominant group, the asteroids evolve to intersect the Earth's orbit on a median time scale of about 60 Myr." "The MB group is the most numerous group of MCs. ... 50 % of the MB Mars-crossers [MCs] become ECs within 59.9 Myr and [this] contribution ... dominates the production of ECs". MB denotes the main belt of asteroids. EC denotes Earth-crossing. "Asteroids ... are space weathered by radiation." At right is an image of asteroid 243 Ida and its moon which is visible to the right of the asteroid. This picture is made from images through the 410.0-nm (violet), 756.0 nm (infrared) and 968.0 nm (infrared) filters. The color is 'enhanced' in the sense that the CCD camera is sensitive to near infrared wavelengths of light beyond human vision; a 'natural' color picture of this asteroid would appear mostly gray. Shadings in the image indicate changes in illumination angle on the many steep slopes of this irregular body as well as subtle color variations due to differences in the physical state and composition of the soil (regolith). There are brighter areas, appearing bluish in the picture, around craters on the upper left end of Ida, around the small bright crater near the center of the asteroid, and near the upper right-hand edge (the limb). This is a combination of more reflected blue light and greater absorption of near infrared light, suggesting a difference in the abundance or composition of iron-bearing minerals in these areas. Ida's moon also has a deeper near-infrared absorption and a different color in the violet than any area on this side of Ida. The moon is not identical in spectral properties to any area of Ida in view here, though its overall similarity in reflectance and general spectral type suggests that it is made of the same rock types basically. Ceres viewed by the Dawn spacecraft on 6 May 2015 at a distance of 13,600 km (8,500 mi). Credit: NASA, JPL-Caltech, UCLA, MPS, DLR, IDA. (d) is not a satellite" is called a dwarf planet. Ceres is the smallest identified dwarf planet in the solar system and the only one in the asteroid belt. "[A] planet orbiting a G2.5 star, 51 Pegasi, 14 parsecs away ... [has] a 4.23-day period, a semi-major axis of 0.05 A.U., an eccentricity less than 0.15, and an inferred mass between 0.5 and 3 Jupiter masses (MJ)" "[T]he tell-tale periodic Doppler shift in the spectral lines of the primary [verifying the presence of the gas giant] had been confirmed". "The production and escape of hot ions (H+ and H+2) and hot atomic hydrogen by stellar ultraviolet radiation is ... likely". "Ammonia clouds [and] water clouds ... will be absent in 51 Peg B ... At an effective temperature of roughly 1250 K, the primary cloud-forming materials near the surface are magnesium silicates and other silicate compounds." Gas giants such as those in orbit around the Sun suggest themselves as failed stars or subdwarfs. At the least, they are usually larger than rocky planets. Whether there are rocky planets consistently larger than gas giants remains to be discovered. A division of astronomical bodies between rocky planets and gas giants (including stars) may be natural and informative. This division allows moons like Io to be viewed as planets like Earth rather than a satellite around a star like Jupiter. A further benefit is the view of gaseous astronomical objects as potential stars, failed stars, or stars radiant over peak radiation bands. These objects may be best studied as a part of stellar science. The Moon described above is a natural satellite of Earth. If the Moon were in orbit around the Sun, it would likely be considered a rocky planet. A terrestrial planet, telluric planet or rocky planet is a planet that is composed primarily of silicate rocks or metals. Within the Solar System, the terrestrial planets are the inner planets closest to the Sun. The terms are derived from Latin words for Earth (Terra and Tellus), so these planets are, in a certain way, "Earth-like". Terrestrial planets have solid planetary surface making them substantially different from gas giants, which are composed mostly of some combination of hydrogen, helium, and water existing in various physical states. At right is a complete global color image of Callisto. Bright scars on a darker surface testify to a long history of impacts on Jupiter's moon Callisto. The picture, taken in May 2001, is the only complete global color image of Callisto obtained by Galileo, which has been orbiting Jupiter since December 1995. Of Jupiter's four largest moons, Callisto orbits farthest from the giant planet. Callisto's surface is uniformly cratered but is not uniform in color or brightness. Scientists believe the brighter areas are mainly ice and the darker areas are highly eroded, ice-poor material. Callisto rotates synchronously with its orbital period, so the same hemisphere always faces (is tidally locked to) Jupiter. Callisto's surface is less affected by Jupiter's magnetosphere than the other inner satellites because it orbits farther away. Compounds detected spectroscopically on the surface include water ice, carbon dioxide, silicates, and organic compounds. The surface of Callisto is heavily cratered and extremely old. It does not show any signatures of subsurface processes such as plate tectonics or volcanism, and is thought to have evolved predominantly under the influence of impacts. Prominent surface features include multi-ring structures, variously shaped impact craters, and chains of craters (catenae) and associated scarps, ridges and deposits. At a small scale, the surface is varied and consists of small, bright frost deposits at the tops of elevations, surrounded by a low-lying, smooth blanket of dark material. Callisto has a very tenuous atmosphere composed of carbon dioxide. It was detected by the Galileo Near Infrared Mapping Spectrometer (NIMS) from its absorption feature near the wavelength 4.2 micrometers. The surface pressure is estimated to be 7.5 x 10-12 bar (0.75 µPa) and particle density 4 x 108 cm−3. Because such a thin atmosphere would be lost in only about 4 days (see atmospheric escape), it must be constantly replenished, possibly by slow sublimation of carbon dioxide ice from the satellite's icy crust, which would be compatible with the sublimation–degradation hypothesis for the formation of the surface knobs. Callisto's ionosphere was first detected during Galileo flybys; its high electron density of 7–17 x 104 cm−3 cannot be explained by the photoionization of the atmospheric carbon dioxide alone. This image shows two views of the trailing hemisphere of Jupiter's ice-covered satellite, Europa. The left image shows the approximate natural color appearance of Europa. Credit: NASA/Deutsche Forschungsanstalt für Luft- und Raumfahrt e.V., Berlin, Germany. The image at right is a composite of two images of Europa. The left image shows the approximate natural color appearance of Europa. The image on the right is a false-color composite version combining violet, green and infrared images to enhance color differences in the predominantly water-ice crust of Europa. Dark brown areas represent rocky material derived from the interior, implanted by impact, or from a combination of interior and exterior sources. Bright plains in the polar areas (top and bottom) are shown in tones of blue to distinguish possibly coarse-grained ice (dark blue) from fine-grained ice (light blue). Long, dark lines are fractures in the crust, some of which are more than 3,000 kilometers (1,850 miles) long. The bright feature containing a central dark spot in the lower third of the image is a young impact crater some 50 kilometers (31 miles) in diameter. This crater has been provisionally named "Pwyll" for the Celtic god of the underworld. This image was taken on September 7, 1996, at a range of 677,000 kilometers (417,900 miles) by the solid state imaging television camera onboard the Galileo spacecraft during its second orbit around Jupiter. Europa is about 3,160 kilometers (1,950 miles) in diameter, or about the size of Earth's moon. This is global pictoral map of Ganymede. Credit: National Oceanic and Atmospheric Administration/USGS. "If Ganymede rotated around the Sun rather than around Jupiter, it would be classified as a planet." "Ganymede has a very distinct surface with bright and dark regions. The surface includes mountains, valleys, craters and lava flows. The darker regions are more heavily littered with craters implying that those regions are older. The largest dark region is named Galileo Regio and is almost 2000 miles [3200 km] in diameter. The lighter regions display extensive series of troughs and ridges, thought to be a result of tectonic movement." "A notable attribute of the craters on Ganymede is that they are not very deep and don’t have mountains around the edges of them as can normally be seen around craters on other moons and planets. The reason for this is that the crust of Ganymede is relatively soft and over a geological time frame has flattened out the extreme elevation changes." This is a true-color image of Io taken by the Galileo probe. Credit: NASA. Io is the innermost of the four Galilean moons of the planet Jupiter and, with a diameter of 3,642 kilometres (2,263 mi), the fourth-largest moon in the Solar System. With over 400 active volcanoes, Io is the most geologically active object in the Solar System. Most of Io's surface is characterized by extensive plains coated with sulfur and sulfur dioxide frost. Io's volcanism is responsible for many of the satellite's unique features. Its volcanic plumes and lava flows produce large surface changes and paint the surface in various shades of yellow, red, white, black, and green, largely due to allotropes and compounds of sulfur. This is a natural color image of Titan. Credit: NASA/JPL/Space Science Institute. This is a mosaic of infrared images of Titan with nomenclature. Credit: Hargitai. Titan like Venus is another gas dwarf when viewed in visible light. Much as with Venus prior to the Space Age, the dense, opaque atmosphere prevented understanding of Titan's surface until new information accumulated with the arrival of the Cassini–Huygens mission in 2004, including the discovery of liquid hydrocarbon lakes in the polar regions. It is larger by volume than Mercury. Seasonal changes in the atmosphere of Saturn's largest moon Titan are captured in this natural colour image at right. It shows Titan with a slightly darker top half and a slightly lighter bottom half. Titan's atmosphere has a seasonal hemispheric dichotomy, and this image was taken shortly after Saturn's August 2009 equinox. Images taken using red, green and blue spectral filters were combined to create this natural colour view. The winter hemisphere typically appears to have more high-altitude haze, making it darker at shorter wavelengths (ultraviolet through blue) and brighter at infra-red wavelengths. The switch between dark and bright occurs over the course of a year or two around the last equinox. Scientists are studying the mechanism responsible for this change, and will monitor the dark-light difference as it flip-flops now that the 2009 equinox has signalled the coming of spring and then summer in the northern hemisphere. Although this hemispheric boundary appears to run directly east-west near the equator, its position is not level with latitude and is actually offset from the equator by about 10 degrees. This view looks toward the Saturn-facing side of Titan (5150 kilometres across). North on Titan is up. The images were obtained with the Cassini spacecraft wide-angle camera at a distance of approximately 174,000 kilometres from Titan. The atmosphere of Titan is largely composed of nitrogen; minor components lead to the formation of methane and ethane clouds and nitrogen-rich organic smog. There is clear evidence that Titan has stable bodies of surface liquid. Titan is primarily composed of water ice and rocky material. Mountains and several possible cryovolcanoes have been discovered. The surface is smooth and few impact craters have been found. The climate—including wind and rain—creates surface features similar to those of Earth, such as sand dunes, rivers, lakes and seas (probably of liquid methane and ethane), and deltas, and is dominated by seasonal weather patterns as on Earth. With its liquids (both surface and subsurface) and robust nitrogen atmosphere, Titan's methane cycle is viewed as an analog to Earth's water cycle, although at a much lower temperature. This high-resolution color composite of Titania was made from Voyager 2 images taken January 24, 1986, as the spacecraft neared its closest approach to Uranus. Credit: NASA/JPL. Derivative work: Ruslik. Voyager's narrow-angle camera acquired the image at right of Titania, one of the large moons of Uranus, through the violet and clear filters. The spacecraft was about 500,000 kilometers (300,000 miles) away; the picture shows details about 9 km (6 mi) in size. Titania has a diameter of about 1,600 km (1,000 mi). In addition to many scars due to impacts, Titania displays evidence of other geologic activity at some point in its history. The large, trenchlike feature near the terminator (day-night boundary) at middle right suggests at least one episode of tectonic activity. Another, basinlike structure near the upper right is evidence of an ancient period of heavy impact activity. The neutral gray color of Titania is characteristic of the Uranian satellites as a whole. Titania consists of approximately equal amounts of ice and rock. The surface has a mottled appearance with bright patches among relatively dark terrain. The terminator is located near the right edge. A large crater can be seen at the terminator in the upper half of the image. Another bright crater can be seen at the bottom. A large canyon runs from the darkness at the lower-right side to visible center of the body. The surface of Titania, which is relatively dark and slightly red in color, appears to have been shaped by both impacts and endogenic processes. It is covered with numerous impact craters reaching up to 326 km in diameter ... Titania's surface is cut by a system of enormous canyons and scarps, the result of the expansion of its interior during the later stages of its evolution. Infrared spectroscopy conducted from 2001 to 2005 revealed the presence of water ice as well as frozen carbon dioxide on the surface of Titania, which in turn suggested that the moon may possess a tenuous carbon dioxide atmosphere with a surface pressure of about one 10 trillionth of a bar. Measurements during Titania's occultation of a star put an upper limit on the surface pressure of any possible atmosphere at 10–20 nbar. This is a global color mosaic of Triton, taken in 1989 by Voyager 2 during its flyby of the Neptune system. Credit: NASA / Jet Propulsion Lab / U.S. Geological Survey. The image at right is a global color mosaic of Triton, taken in 1989 by Voyager 2 during its flyby of the Neptune system. Color was synthesized by combining high-resolution images taken through orange, violet, and ultraviolet filters; these images were displayed as red, green, and blue images and combined to create this color version. With a radius of 1,350 km (839 mi), about 22% smaller than Earth's moon, Triton is by far the largest satellite of Neptune. It is one of only three objects in the Solar System known to have a nitrogen-dominated atmosphere (the others are Earth and Saturn's giant moon, Titan). Triton has the coldest surface known anywhere in the Solar System (38 K, about -391 degrees Fahrenheit); it is so cold that most of Triton's nitrogen is condensed as frost, making it the only satellite in the Solar System known to have a surface made mainly of nitrogen ice. The pinkish deposits constitute a vast south polar cap believed to contain methane ice, which would have reacted under sunlight to form pink or red compounds. The dark streaks overlying these pink ices are believed to be an icy and perhaps carbonaceous dust deposited from huge geyser-like plumes, some of which were found to be active during the Voyager 2 flyby. The bluish-green band visible in this image extends all the way around Triton near the equator; it may consist of relatively fresh nitrogen frost deposits. The greenish areas includes what is called the cantaloupe terrain, whose origin is unknown, and a set of "cryovolcanic" landscapes apparently produced by icy-cold liquids (now frozen) erupted from Triton's interior. Triton is the only large moon in the solar system with a retrograde orbit. Triton is one of the few moons in the Solar System known to be geologically active. As a consequence, its surface is relatively young, with a complex geological history revealed in intricate and mysterious cryovolcanic and tectonic terrains. Part of its crust is dotted with geysers thought to erupt nitrogen. Triton has a tenuous nitrogen atmosphere less than 1/70,000 the pressure of Earth's atmosphere at sea level. This animation made from Hubble photo maps shows Pluto rotating. Credit: Aineias, NASA, ESA, and M. Buie (Southwest Research Institute). Derivative work: Aineias. Pluto is a dwarf planet. It is only one of several large bodies within the Kuiper belt. Like other members of the Kuiper belt, Pluto is composed primarily of rock and ice. Pluto's surface has changed between 1994 and 2002-3: the northern polar region has brightened and the southern hemisphere darkened. Pluto's overall redness has also increased substantially between 2000 and 2002. These rapid changes are probably related to seasonal condensation and sublimation of portions of Pluto's atmosphere, amplified by Pluto's extreme axial tilt and high orbital eccentricity. Def. "[a]ll other objects [not a planet or dwarf planet], except satellites, orbiting the Sun" are called collectively Small Solar-System Bodies. This is a photograph taken in 1910 during the passage of Halley's comet. Credit: The Yerkes Observatory. The 1910 approach [of Halley's comet], which came into naked-eye view around 10 April and came to perihelion on 20 April, was notable for several reasons: it was the first approach of which photographs exist, and the first for which spectroscopic data were obtained. Furthermore, the comet made a relatively close approach of 0.15AU, making it a spectacular sight. Indeed, on 19 May, the Earth actually passed through the tail of the comet. One of the substances discovered in the tail by spectroscopic analysis was the toxic gas cyanogen, which led astronomer Camille Flammarion to claim that, when Earth passed through the tail, the gas "would impregnate the atmosphere and possibly snuff out all life on the planet." His pronouncement led to panicked buying of gas masks and quack "anti-comet pills" and "anti-comet umbrellas" by the public. In reality, as other astronomers were quick to point out, the gas is so diffuse that the world suffered no ill effects from the passage through the tail. "It is quite possible that [faint streamers preceding the main tail and lying nearly in the prolonged radius vector] may have touched the Earth, probably between May 19.0 and May 19.5, [1910,] but the Earth must have passed considerably to the south of the main portion of the tail [of Halley's comet]." A magnetohydrodynamics (MHD) and chemical comet-coma model is applied to describe and analyze the plasma flow, magnetic field, and ion abundances in Comet Halley. A comparison of model results is made with the data from the Giotto mission. "In the second dominant group of ions we generally see more discrepancies in the model and the HIS data". The principal application of the dominant group concept is to the ion density measurements at or within 1500 km of the comet nucleus, where "the model abundances for the light ions, up to 21 amu, are in very good agreement with the 1500 km observations." The comparison between model and measurements "generally becomes worse as one considers higher molecular masses and greater distance from the [comet] nucleus." For elongated dust particles in cometary comas an investigation is performed at 535.0 nm (green) and 627.4 nm (red) peak transmission wavelengths of the Rosetta spacecraft's OSIRIS Wide Angle Camera broadband green and red filters, respectively. "In the green, the polarization of the pure silicate composition qualitatively appears a better fit to the shape of the observed polarization curves". "[B]ut they are characterized by a high albedo." The silicates used to model the cometary coma dust are olivene (Mg-rich is green) and the pyroxene, enstatite. 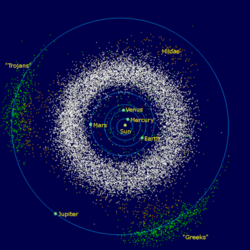 Known objects in the Kuiper belt, are derived from data from the Minor Planet Center. Credit: . In the image at right, objects in the main part of the Kuiper belt are coloured green, while scattered objects are coloured orange. The four outer planets are blue. Neptune's few known trojans are yellow, while Jupiter's are pink. The scattered objects between Jupiter's orbit and the Kuiper belt are known as centaurs. The scale is in astronomical units. The pronounced gap at the bottom is due to difficulties in detection against the background of the plane of the Milky Way. The Kuiper belt is a region of the solar system extending from the orbit of Neptune (at 30 AU to approximately 60 AU from the Sun. It consists mainly of small bodies. The dwarf planet Eris is the largest known scattered-disc object (center), with its moon Dysnomia (left of object). Credit: NASA, ESA, and Michael E. Brown. The scattered disc (or scattered disk) is a distant region of the Solar System that is sparsely populated by icy minor planets, a subset of the broader family of trans-Neptunian objects. The scattered-disc objects (SDOs) have orbital eccentricities ranging as high as 0.8, inclinations as high as 40°, and perihelia greater than 30 astronomical units (4.5 x 109 km; 2.8 x 109 mi.). While the nearest distance to the Sun approached by scattered objects is about 30–35 AU, their orbits can extend well beyond 100 AU. This makes scattered objects "among the most distant and cold objects in the Solar System". Here, the presumed distance of the Oort cloud is compared to the rest of the Solar System using the orbit of Sedna. Credit: NASA / JPL-Caltech / R. Hurt. Sedna, a possible inner Oort cloud object, is a discovery in 2003. Credit: . The Oort cloud or the Öpik–Oort cloud is a hypothesized spherical cloud of comets which may lie roughly 50,000 AU, or nearly a light-year, from the Sun. This places the cloud at nearly a quarter of the distance to Proxima Centauri, the nearest star to the Sun. The outer limit of the Oort cloud defines the cosmographical boundary of the Solar System and the region of the Sun's gravitational dominance. Def. the region of space where interstellar medium is blown away by solar wind; the boundary, heliopause, is often considered the edge of the Solar System is called the heliosphere. The heliosphere is a bubble in space "blown" into the interstellar medium (the hydrogen and helium gas that permeates the galaxy) by the solar wind. Although electrically neutral atoms from interstellar volume can penetrate this bubble, virtually all of the material in the heliosphere emanates from the Sun itself. The point where the solar wind slows down is the termination shock. Further out "is the heliosheath area As of June 2011, the heliosheath area is thought to be filled with magnetic bubbles (each about 1 AU wide), creating a "foamy zone". As of December 5, 2011, "Voyager 1 is about ... 18 billion kilometers ... from the [S]un [but] the direction of the magnetic field lines has not changed, indicating Voyager is still within the heliosphere ... the outward speed of the solar wind had diminished to zero in April 2010 ... inward pressure from interstellar space is compacting [the magnetic field] ... Voyager has detected a 100-fold increase in the intensity of high-energy electrons from elsewhere in the galaxy diffusing into our solar system from outside ... [while] the [solar] wind even blows back at us." The point where the interstellar medium and solar wind pressures balance is called the heliopause. The point where the interstellar medium, traveling in the opposite direction, slows down as it collides with the heliosphere is the bow shock. (c) is neither a star nor a satellite of a planet" is called an extrasolar planet. "The dominant group of detectable eclipsing binaries consists of two detached main-sequence stars." "In the case of survey model 1 and a flat initial mass ratio distribution, this subgroup of systems accounts for 60% of the population of detectable eclipsing binaries." "In this exploratory study we used the BiSEPS binary population synthesis code to estimate the number of eclipsing binaries and single stars detectable in the Galactic disc by an idealised Super-WASP exoplanet transit survey." Most known exoplanets are giant planets believed to resemble Jupiter or Neptune. On 21 April 1992, radio astronomers Aleksander Wolszczan and Dale Frail announced the discovery of two planets orbiting the pulsar PSR 1257+12. This discovery was confirmed, and is generally considered to be the first definitive detection of exoplanets. NASA's Kepler spacecraft discovered that Kepler-36b has a rocky surface with about 30% of its mass comprised of iron. Its mass is "about 4.5 times Earth's ..., and [it] is about 1.5 times as large." "The shape of objects with mass above 5 x 1020 kg and diameter greater than 800 km would normally be determined by self-gravity, but all borderline cases would have to be established by observation." The sciences study the effects on the planet of revolving about one or more stars. ↑ 1.0 1.1 Stuart Ross Taylor (29 July 2004). "Why can't planets be like stars?". Nature 430 (6999): 509. doi:10.1038/430509a. PMID 15282586. http://www.nature.com/nature/journal/v430/n6999/full/430509a.html. ↑ 2.0 2.1 2.2 2.3 2.4 2.5 2.6 2.7 Theodore E. Madey, Robert E. Johnson, Thom M. Orlando (March 2002). "Far-out surface science: radiation-induced surface processes in the solar system". Surface Science 500 (1-3): 838-58. doi:10.1016/S0039-6028(01)01556-4. http://www.physics.rutgers.edu/~madey/Publications/Full_Publications/PDF/madey_SS_2002.pdf. Retrieved 2012-02-09. ↑ 3.0 3.1 3.2 3.3 Jean Baptiste Joseph Delambre (1817). Histoire de l'astronomie ancienne. Paris: Courcier. p. 639. Retrieved 2012-01-13. ↑ 4.0 4.1 Immanuel Velikovsky (January 1965). Worlds in Collision. New York: Dell Publishing Co., Inc. p. 401. Retrieved 2012-01-13. ↑ 5.0 5.1 5.2 5.3 5.4 5.5 Lars Lindberg Christensen (August 24, 2006). IAU 2006 General Assembly: Result of the IAU Resolution votes (PDF). International Astronomical Union. Retrieved 2011-10-30. ↑ Anthony Whitworth, Dimitri Stamatellos, Steffi Walch, Murat Kaplan, Simon Goodwin, David Hubber and Richard Parker (2009). R. de Grijs & J. R. D. Lépine. ed. The formation of brown dwarfs, In: Star clusters: basic galactic building blocks, Proceedings IAU Symposium No. 266. International Astronomical Union. pp. 264-71. doi:10.1017/S174392130999113X. http://arxiv.org/pdf/astro-ph/0602367. Retrieved 2011-10-30. ↑ Ontario Science Centre website. ↑ JetStream, In: Layers of the Atmosphere, the National Weather Service Online Weather School. National Weather Service. Retrieved 22 December 2005. ↑ 10.0 10.1 10.2 10.3 10.4 10.5 10.6 Susan Taylor, Gregory F. Herzog, Gregory, Jeremy S. Delaney, (2007). "Crumbs from the crust of Vesta: Achondritic cosmic spherules from the South Pole water well". Meteoritics & Planetary Science 42 (2): 223-33. doi:10.1111/j.1945-5100.2007.tb00229.x. ↑ A. R. W. McKellar (November 1989). "The spectrum of gaseous methane at 77 K in the 1.1-2.6 μm region: a benchmark for planetary astronomy". Canadian Journal of Physics 67 (11): 1027-35. doi:10.1139/p89-180. http://www.nrcresearchpress.com/doi/abs/10.1139/p89-180. Retrieved 2012-02-09. ↑ Steven J. Ostro (October-December 1993). "Planetary radar astronomy". Reviews of Modern Physics 65 (4): 1235-79. doi:10.1103/RevModPhys.65.1235. http://rmp.aps.org/abstract/RMP/v65/i4/p1235_1. Retrieved 2012-02-09. ↑ Bernard R. Goldstein (1997). "Saving the phenomena : the background to Ptolemy's planetary theory". Journal for the History of Astronomy (Cambridge (UK)) 28 (1): 1–12. ↑ Ptolemy, G. J. Toomer (1998). Ptolemy's Almagest. Princeton University Press. ISBN 9780691002606. ↑ Burton Raffel (Winter 1970). "Homeric Hymn to Demeter 1-89". Arion 9 (4): 415-20. doi:10.2307/20163307. http://www.jstor.org/stable/10.2307/20163307. Retrieved 2012-04-24. ↑ Roger Pack (1946). "Notes on the Caesars of Julian". Transactions and Proceedings of the American Philological Association 77: 151-7. http://www.jstor.org/stable/10.2307/283452. Retrieved 2012-04-24. ↑ Charles Schlemm, Richard D. Starr, George C. Ho, Kathryn E. Bechtold, Sarah A. Hamilton, John D. Boldt, William V. Boynton, Walter Bradley, Martin E. Fraeman and Robert E. Gold, et al. (2007). "The X-Ray Spectrometer on the MESSENGER Spacecraft". Space Science Reviews 131 (1): 393–415. doi:10.1007/s11214-007-9248-5. ↑ X-ray Spectrometer (XRS). NASA / National Space Science Data Center. Retrieved 2011-02-19. ↑ W. H. Wright (August 1927). 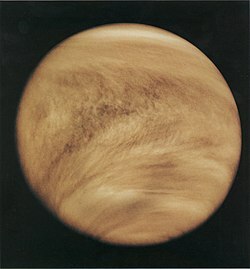 "Photographs of Venus made by Infra-red and by Violet Light". Publications of the Astronomical Society of the Pacific 39 (230): 220-1. doi:10.1086/123718. ↑ 22.0 22.1 Philip B. Gove, ed. (1963). Webster's Seventh New Collegiate Dictionary. Springfield, Massachusetts: G. & C. Merriam Company. p. 1221. Retrieved 2011-08-26. ↑ 23.0 23.1 23.2 23.3 23.4 David Hill (July 29, 2011). Ancient Tides Different from Today - Some Dramatically Higher. Corvallis, Oregon: Oregon State University. Retrieved 2012-05-27. ↑ Warren Wiscombe (June 14, 2006). High and Low Tides in Bay of Fundy. NASA Goddard Space Flight Center: NASA Earth Observatory. Retrieved 2012-05-27. ↑ Samantha Harvey (September 28, 2011). Aurora Over Norway. NASA. Retrieved 2012-07-21. ↑ Feldstein, Y. I. (1963). "Some problems concerning the morphology of auroras and magnetic disturbances at high latitudes". Geomagnetism and Aeronomy 3: 183–192. https://www.osti.gov/scitech/biblio/4077408. ↑ Feldstein, Y. I. (1986). "A Quarter Century with the Auroral Oval". EOS 67 (40): 761. doi:10.1029/EO067i040p00761-02. ↑ E. J. Weber et al. (1984). "F layer ionization patches in the polar cap". J. Geophys. Res. 89 (A3): 1683–94. doi:10.1029/JA089iA03p01683. ↑ Frank, L. A. et al. (1986). "The theta aurora". J. Geophys. Res. 91 (A3): 3177–3224. doi:10.1029/JA091iA03p03177. ↑ U.S. Inan, S.C. Reising, G.J. Fishman, and J.M. Horack. On the association of terrestrial gamma-ray bursts with lightning and implications for sprites. Geophysical Research Letters, 23(9):1017-20, May 1996. As quoted by elf.gi.alaska.edu Retrieved 2007-03-06. ↑ M. E. Lefébure (November 1900). "The Zodiacal Light according to the Ancients". The Observatory, A Monthly Review of Astronomy 23 (298): 393-8. http://adsabs.harvard.edu/cgi-bin/nph-data_query?bibcode=1900Obs....23..393.&link_type=ARTICLE&db_key=AST&high=. Retrieved 2011-11-08. ↑ D. F. Heath, M. P. Thekackara (1977). In: The Solar Output and its Variation. Boulder, Colorado: Colorado Association University Press. p. 193. Bibcode:1977soiv.conf.....W. Retrieved 2012-02-09. ↑ 35.0 35.1 35.2 David R. Williams (November 2011). Lunar Prospector Neutron Spectrometer (NS). Goddard Space Flight Laboratory: National Aeronautics and Space Administration. Retrieved 2012-01-11. ↑ T. E. Cravens (2000). "X-ray emission from comets and planets". Advances in Space Research 26 (10): 1443-51. doi:0.1016/S0273-1177(00)00100-9. http://www.sciencedirect.com/science/article/pii/S0273117700001009. Retrieved 2012-01-11. ↑ Robert Burnham (2004). Moon Prospecting. Kalmbach Publishing Co. Retrieved 2012-01-11. ↑ CGRO SSC >> EGRET Detection of Gamma Rays from the Moon. Heasarc.gsfc.nasa.gov. 2005-08-01. Retrieved 2011-11-08. ↑ D. J. Lawrence, * W. C. Feldman, B. L. Barraclough, A. B. Binder, R. C. Elphic, S. Maurice, D. R. Thomsen (1998). "Global Elemental Maps of the Moon: The Lunar Prospector Gamma-Ray Spectrometer". Science 281 (5382): 1484–1489. doi:10.1126/science.281.5382.1484. PMID 9727970. ↑ Hiroshi Ishimoto (June 1998). "Collisional evolution and the resulting mass distribution of interplanetary dust". Earth, Planets, and Space 50 (6): 521-9. http://www.terrapub.co.jp/journals/EPS/pdf/5006_07/50060521.pdf. Retrieved 2011-10-06. ↑ The Lure of Hematite. Science@NASA. NASA. March 28, 2001. Retrieved 2009-12-24. ↑ Mark Peplow. How Mars got its rust. BioEd Online. MacMillan Publishers Ltd. Retrieved 2007-03-10. ↑ Philip R. Christensen, et al. (June 27, 2003). "Morphology and Composition of the Surface of Mars: Mars Odyssey THEMIS Results". Science 300 (5628): 2056–61. doi:10.1126/science.1080885. PMID 12791998. ↑ Matthew P. Golombek (June 27, 2003). [science.sciencemag.org/content/300/5628/2043 "The Surface of Mars: Not Just Dust and Rocks"]. Science 300 (5628): 2043–2044. doi:10.1126/science.1082927. PMID 12829771. science.sciencemag.org/content/300/5628/2043. ↑ Edward Tedesco, Leo Metcalfe (April 4, 2002). New study reveals twice as many asteroids as previously believed. European Space Agency. Retrieved 2008-02-21. ↑ V. V. Emel’yanenko (December 2005). "Structure and dynamics of the Centaur population: constraints on the origin of short-period comets". Earth, Moon, and Planets 97 (3-4): 341-51. doi:10.1007/s11038-006-9095-5. http://dccm.susu.ac.ru/acm2005.pdf. Retrieved 2011-10-06. ↑ 48.0 48.1 48.2 48.3 Patrick Michel, Fabbio Migliorini, Alessandro Morbidelli, Vincenzo Zappalà (June 2000). "The Population of Mars-Crossers: Classification and Dynamical Evolution". Icarus 145 (2): 332-47. doi:10.1006/icar.2000.6358. http://www.obs-nice.fr/morby/papers/6358a.pdf. Retrieved 2011-10-06. ↑ NASA – Dawn at a Glance. NASA. Retrieved 14 August 2011. ↑ Shiga, David. Dawn captures first orbital image of asteroid Vesta. New Scientist. Retrieved 7 August 2011. ↑ Space Telescope Science Institute (2009). Hubble 2008: Science year in review. NASA Goddard Space Flight Center. p. 66. ↑ 52.0 52.1 52.2 52.3 T. Guillot, A. Burrows, W. B. Hubbard, J. I. Lunine and D. Saumon (March 1996). "Giant Planets at Small Orbital Distances". The Astrophysical Journal 459 (3): L35-8. doi:10.1086/309935. http://iopscience.iop.org/1538-4357/459/1/L35. Retrieved 2012-02-09. ↑ John F. Cooper, Johnson, Robert E.; Mauk, Barry H.; et al. (2001). "Energetic Ion and Electron Irradiation of the Icy Galilean Satellites". Icarus 139 (1): 133–159. doi:10.1006/icar.2000.6498. http://people.virginia.edu/~rej/Icarus_Jan2001_Cooper_et_al.pdf. ↑ 54.0 54.1 Greeley, R.; Klemaszewski, J. E.; Wagner, L.; et al. (2000). "Galileo views of the geology of Callisto". Planetary and Space Science 48 (9): 829–853. doi:10.1016/S0032-0633(00)00050-7. ↑ 56.0 56.1 Carlson, R. W.; et al. (1999). "A Tenuous Carbon Dioxide Atmosphere on Jupiter's Moon Callisto". Science 283 (5403): 820–821. doi:10.1126/science.283.5403.820. PMID 9933159. http://trs-new.jpl.nasa.gov/dspace/bitstream/2014/16785/1/99-0186.pdf. ↑ A. J. Kliore, A. Anabtawi, R. G. Herrera, et al. (2002). "Ionosphere of Callisto from Galileo radio occultation observations". Journal of Geophysics Research 107 (A11): 1407. doi:10.1029/2002JA009365. ↑ 58.0 58.1 58.2 Bjorn Jonsson and Steve Albers (October 17, 2000). Ganymede (Jupiter moon). NOAA. Retrieved 2012-07-01. ↑ Lopes, R. M. C. et al. (2004). "Lava lakes on Io: Observations of Io’s volcanic activity from Galileo NIMS during the 2001 fly-bys". Icarus 169 (1): 140–174. doi:10.1016/j.icarus.2003.11.013. ↑ Stofan, E. R.; Elachi, C.; Lunine, J. I.; Lorenz, R. D.; Stiles, B.; Mitchell, K. L.; Ostro, S.; Soderblom, L. et al. (2007). "The lakes of Titan". Nature 445 (1): 61–64. doi:10.1038/nature05438. PMID 17203056. ↑ 63.0 63.1 Neptune: Moons: Triton. NASA. Retrieved 2007-09-21. ↑ 64.0 64.1 64.2 New Hubble Maps of Pluto Show Surface Changes. News Release Number: STScI-2010-06. February 4, 2010. Retrieved February 10, 2010. ↑ 65.0 65.1 65.2 D. K. Yeomans (1998). Great Comets in History. Jet Propulsion Laboratory. Retrieved 15 March 2007. ↑ D. A. Mendis (1988). "A Postencounter view of comets". Annual Review of Astronomy and Astrophysics 26 (1): 11–49. doi:10.1146/annurev.aa.26.090188.000303. ↑ Ian Ridpath (1985). Through the comet’s tail. Revised extracts from A Comet Called Halley by Ian Ridpath, published by Cambridge University Press in 1985. Retrieved 2011-06-19. ↑ Brian Nunnally (May 16, 2011). This Week in Science History: Halley’s Comet. pfizer: ThinkScience Now. Retrieved 2011-06-19. ↑ "Yerkes Observatory Finds Cyanogen in Spectrum of Halley's Comet". The New York Times. 8 February 1910. http://query.nytimes.com/gst/abstract.html?res=9407E4DF1430E233A2575BC0A9649C946196D6CF. Retrieved 15 November 2009. ↑ 70.0 70.1 "Ten Notable Apocalypses That (Obviously) Didn't Happen". Smithsonian magazine. 2009. http://www.smithsonianmag.com/history-archaeology/Ten-Notable-Apocalypses-That-Obviously-Didnt-Happen.html. Retrieved 14 November 2009. ↑ Interesting Facts About Comets. Universe Today. 2009. Retrieved 15 January 2009. ↑ Heber D. Curtis (June 1910). "Photographs of Halley's Comet made at the Lick Observatory". Publications of the Astronomical Society of the Pacific 22 (132): 117-30. ↑ 73.0 73.1 73.2 73.3 73.4 R. Wegmann, H.U. Schmidt, W.F. Huebner, and D.C. Boice (November 1987). "Cometary MHD and chemistry". Astronomy and Astrophysics 187 (1-2): 339-50. ↑ 74.0 74.1 74.2 74.3 I. Bertini, N. Thomas, and C. Barbieri (January 2007). "Modeling of the light scattering properties of cometary dust using fractal aggregates". Astronomy & Astrophysics 461 (1): 351-64. doi:10.1051/0004-6361:20065461. http://www.aanda.org/articles/aa/pdf/2007/01/aa5461-06.pdf. Retrieved 2011-12-08. ↑ Alan Stern; Colwell, Joshua E. (1997). "Collisional Erosion in the Primordial Edgeworth-Kuiper Belt and the Generation of the 30–50 AU Kuiper Gap". The Astrophysical Journal 490 (2): 879–882. doi:10.1086/304912. ↑ Maggie Masetti. (2007). Cosmic Distance Scales – The Solar System. Website of NASA's High Energy Astrophysics Science Archive Research Center. Retrieved 2008 07-12. ↑ Fred Lawrence Whipple, G. Turner, J. A. M. McDonnell, M. K. Wallis (1987-09-30). "A Review of Cometary Sciences". Philosophical Transactions of the Royal Society A (Royal Society Publishing) 323 (1572): 339–347 . doi:10.1098/rsta.1987.0090. http://rsta.royalsocietypublishing.org/content/323/1572/339.short. ↑ Alessandro Morbidelli (2006). Origin and dynamical evolution of comets and their reservoirs of water ammonia and methane. arXiv:astro-ph/0512256. ↑ Kuiper Belt & Oort Cloud, In: NASA Solar System Exploration web site. NASA. Retrieved 2011-08-08. ↑ 82.0 82.1 82.2 B. Willems, U. Kolb, and S. Justham (April 2006). "Eclipsing binaries in extra solar planet transit surveys: the case of SuperWASP". Monthly Notices of the Royal Astronomical Society 367 (3): 1103-12. doi:10.1111/j.1365-2966.2006.10041.x. http://arxiv.org/pdf/astro-ph/0601128. Retrieved 2011-10-06. ↑ Robert Holtz (22 April 1992). Scientists Uncover Evidence of New Planets Orbiting Star. Los Angeles Times. ↑ 85.0 85.1 Pete Spotts (June 21, 2012). NASA finds 2 diverse planets that are relatively close. The Christian Science Monitor. Retrieved 2012-06-25. ↑ Lars Lindberg Christensen (August 16, 2006). The IAU draft definition of "planet" and "plutons". International Astronomical Union. Retrieved 2011-10-30. Carr, Michael H., Saunders, R. S., Strom, R. G., Wilhelms, D. E. 1984. The Geology of the Terrestrial Planets. NASA. Bill Cooke (August 2006). "The Great Interplanetary Rock Swap". Astronomy 34 (8): 64–67. https://www.myscienceshop.com/product/asy060801. Susan Taylor, Gregory F. Herzog, Gregory, Jeremy S. Delaney, (2007). "Crumbs from the crust of Vesta: Achondritic cosmic spherules from the South Pole water well". Meteoritics & Planetary Science 42 (2): 223-33. doi:10.1111/j.1945-5100.2007.tb00229.x. NASA's National Space Science Data Center. This page was last edited on 13 January 2019, at 16:04.